window erupted with joy, cheers and the boom of fireworks echoing across the bay below. Sadly, the Fennecs' complete lack of offense caught up with them, and Belgium won 2-1. There were many long faces around town the next day as the jubilation of reaching the Cup gave way to worries of a fast exit. But the second game breathed new life into the Algerian supporters. A wholly different team seemed to have taken the field. The Fennecs attacked, they controlled the ball, they outran what was known as a speedy Korean team. And then, finally, they scored. And scored, and scored. Each time, as the ball flew toward the goal, the city below me heaved with excitement and then, as it hit the net, exploded in a collective cheer. Fireworks flew, car horns honked, and whoops and whistles rushed skyward. Just after Algeria's second goal, the garbage truck rolled past my house. The workers, eager to get home and watch what was quickly becoming a historic win, scrambled behind, flinging trash bags into the truck as if in fast-forward and leaving a trail of garbage behind them. I saw one grab my neighbor and plant a huge kiss on his cheek as he skipped past. As the Fennecs' third match—against a formidable Russian side—approached, friends here expressed cautious hope and plenty of nervousness. Expressing the fatalism that is common here, many also worried that the team was cursed and would never advance beyond this last match of the group stage. Their justification, of course, were the infamous events of the 1982 World Cup in Spain, when Algeria defeated West Germany in a historic match, only to see the German and Austrian teams colluded to eliminate them from the tournament. Algerians who remember watching that year's Cup still speak about it in bitter terms. But the Fennecs did not disappoint in last night's match with Russia, evening the score at 1-1 in the second half and holding on for a tie that earned Algeria its first-ever berth in the Round of 16. I have never seen a people so excited to tie. While the celebrations after the South Korea win had been sizable, yesterday's show was a sight to behold. Given that your average Algerian six-year-old has enough firepower to outgun a small army, the explosions did not slow until well into daylight this morning (and stray bangs have been echoing all day today). Young guys swerved all over the roads, honking and almost spilling out of their cars, waving flags and screaming themselves hoarse. Some friends and I walked downtown to see the crowd filling the streets, shooting firecrackers and flares and hugging one another. A woman tapped me on the shoulder and thrust a red-white-and-green Algerian flag banner into my hand, "Are you foreigners? Here, I want you to have this." Thirty-two years after they were robbed of a chance to advance, ironically this week Algeria will face Germany in the next round. Their odds are slim, but for now the Algerians are just happy to be here, shining on the world stage. 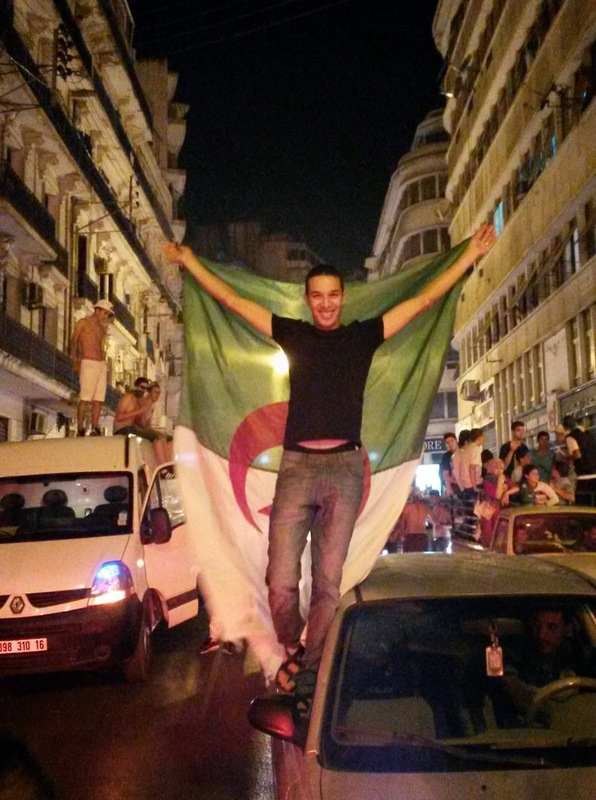 Having seen how the Algerians celebrate a tie, I am almost concerned for my safety if they should actually win a match, but I will be rooting along nonetheless. An incredible video (not my own) of the crowd in Algiers' main square last night when the Russia game ended. See if you are sharp enough to guess when the final whistle blows.